Some travellers also experience a negative reaction to water just because it's different from the water they're used to drinking. So avoiding local tapwater and drinking bottled or purified water instead is essential if you want to protect yourself from illness. 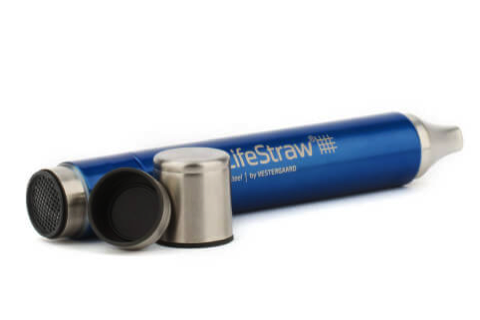 The LifeStraw Steel is a nifty little device that uses a replaceable activated carbon capsule to filter water, making it safe to drink by removing bacteria and protozoa whilst reducing chlorine. It's a brilliant way to ensure you always have access to clean drinking water, especially when bottled water isn't available. Using no electrical power or batteries, the LifeStraw Steel is durable and lightweight – smaller and lighter than many water bottles – and can be slipped into a backpack pocket. The LifeStraw is invaluable in a range of travel situations where fresh drinking water is unavailable or local tap water needs to be filtered – it's particularly useful for camping trips and for long-distance hiking, when it's not always possible to carry enough bottled water for your journey. It will filter up to 1,000 litres (264 gallons) of water. The LifeStraw Steel works like a straw – collect water in a drinking vessel, or you can drink straight from the water source such as river, stream or lake. Unlike water purification tablets there's no nasty after-taste as it uses no chemicals – iodine is often the active ingredient in water purification tablets, and can cause health problems for some people (eg pregnant women). By buying a LifeStraw, you'll also be supporting the Follow the Liters programme. For every LifeStraw sold, one child in a developing country will be provided with enough safe drinking water for one school year, using LifeStraw community water purifiers. Since launching in 2004, the Follow the Liters program has resulted in 361,000 children in 631 schools having access to safe drinking water. This vital work is benefitting vulnerable communities and making a real difference to children's lives.